Ambushing berserkrs are bandits, manhunters, or assassins for hire. They track their prey in the wilderness, preferably under the snow. Then they set up an ambush by burying themselves into the snow, and suprise their prey with a sudden, vicious lunge. Ambusher. 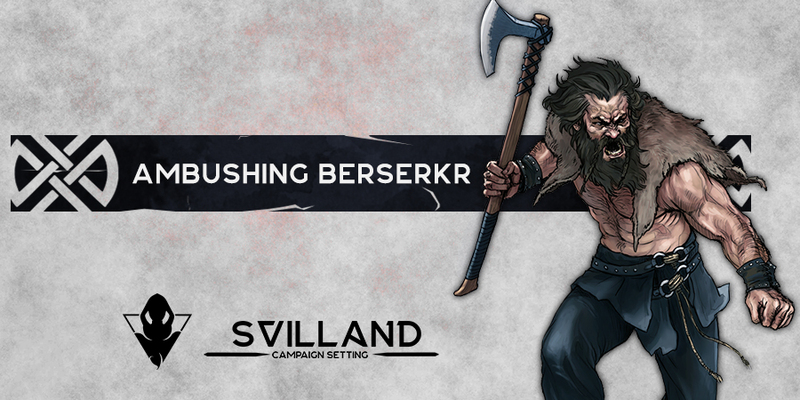 In the beginning of an encounter, the ambushing berserkr can attack to up to 3 surprised creatures that are within 15 ft. of each other and the encounter starting location of the ambushing berserkr, dealing additional 7 (2d6) damage of its weapon to each creature it successfully hits. False Appearance. The ambushing berserkr buries itself into the snow while remaining motionless within the snow, it has advantage on its Dexterity (Stealth) check. Rage. The ambushing berserkr has the +2 damage bonus, and other benefits of the Rage feature of the barbarian. Wearing the Bear’s Skin. The ambushing berserkr adds 5 to its AC because of its Berserkr archetype (included in Armor Class). Svil Fortitude. Can hold its breath for twice as long and it is unaffected by cold climate and Black Winter’s Cold. Stunning Critical. If the ambushing berserkr scores a critical hit on a creature, the creature must succeed on a DC 15 Constitution saving throw or is stunned until the end of its next turn. Multiattack. The ambushing berserkr makes three melee attacks. Battleaxe: Melee Weapon Attack: +7 to hit, reach 5 ft., one target. Hit: 9 (1d8 + 5) piercing damage on hit. Our pre-order just launched! https://gumroad.com/dr_storytellers If you miss Svilland Campaign Setting’s Kickstarter, do not worry, you can purchase with a discount!